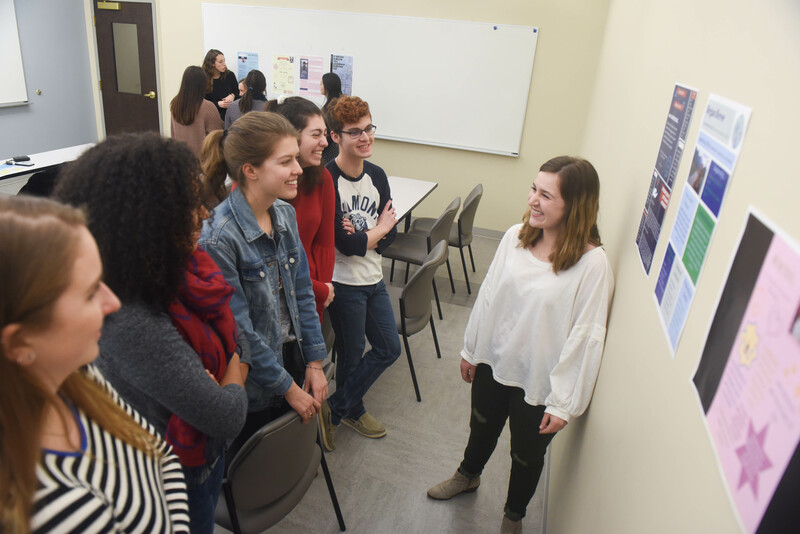 Global Leadership Studies class present their posters at Belmont University in Nashville, Tennessee, December 7, 2017. Belmont University has recently announced changes to the BELL Core, the institution’s general education requirements for students. Led by Director and Associate Professor of Philosophy Dr. Noel Boyle, the BELL Core curriculum supports Belmont’s mission by striving to make students informed and engaged citizens who think critically, act ethically and communicate effectively. Signature Courses: All students, regardless of major or degree track, will complete these courses (First Year Seminar and Junior Cornerstone, among others). Foundation Courses: All students will complete these as well, including courses in science, community and humanities, among others. Degree Cognates: The third section of courses will vary depending on a student’s major or program of study. Depending on a student’s program of study, the total number of hours required could decrease, but no student will be required to earn additional hours under the newly revised Bell Core. Boyle and other representatives from his team will be hosting Town Hall Sessions for both students, faculty and staff throughout the month of February. For more information on the Bell Core change, click here or contact the Office at bellcore@belmont.edu.